When we want to enjoy a low volatility slot. Which gives us plenty of playing time, plenty of rewards and plenty of amazing visuals. We now know where to go. It’s deep into the subterranean caverns of the Crystal Rift Slot. A five reel, 25 payline outing courtesy of Microgaming that promises underground delights and adventure. Crystal Rift gives deep cave exploring a new lease of life. Forget about lifts, winches and dirt covered explorers. This is the new way to do it. On this slot we get to enjoy dark caverns the way they’re supposed to be enjoyed – with glistening crystals that bring us shimmering wins. The main symbols of the slot are made from members of the quartz family, each of them individually designed to look precious and stunning. The reels are set against a transparent reel case, so it’s as if the crystals are floating ethereally on screen. It’s snazzy. Especially when the reels spin and vibrant colours highlight winning combos to light up the dark background, the symbols popping in explosive glee to allow more symbols to tumble in their places. The game’s Cube Wild shimmers so brightly it’s almost painful - a beacon of light in this mysterious underground darkness. 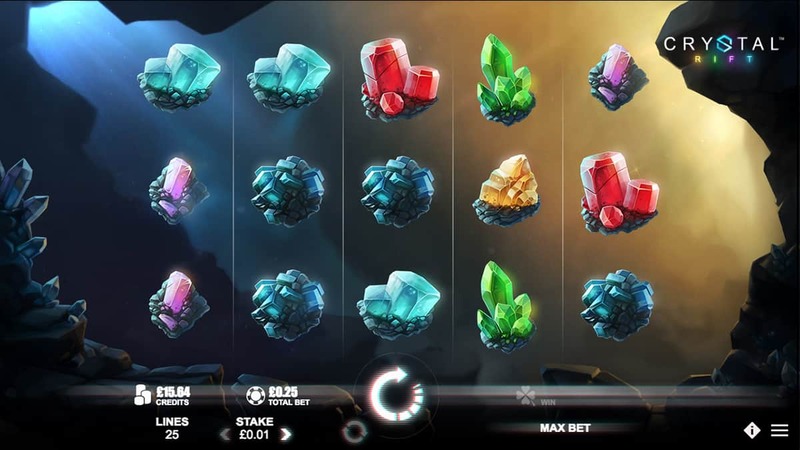 Crystal Rift was created by Rabcat for Microgaming, and it must have got the brief that it needed to create a slot that was truly unique. And boy did it deliver. As the reels spin, we don’t get that disjointed feeling of a spin, a win and a highlight of the paylines. No, siree, it’s a lot better. This slot benefits from cascading reels, or the Bonus Falls Feature as it’s known, which means when we land wins the symbols they then keep falling down to create new combinations. As this happens on each win, it’s the gift that keeps on giving. The Wild Grid Feature lines up symbols in one of 20 grid varieties, turning those reel positions Wild following three concurrent wins. It’s the equivalent of catching a crystal in a net. During this feature, the cascading reels still come in to play so rather than having to constantly trigger bonus features, these run continuously as we play. 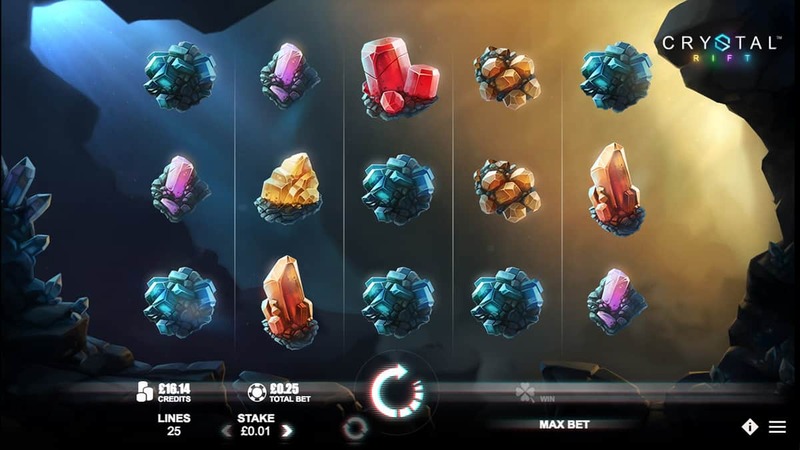 Crystal Rifts is a subtle slot. A simple spin button, an easy-to-understand layout and betting options controllable with a few clicks, sometimes we forget we’re even playing a slot. Especially when we have the soothing soundtrack playing in the background. 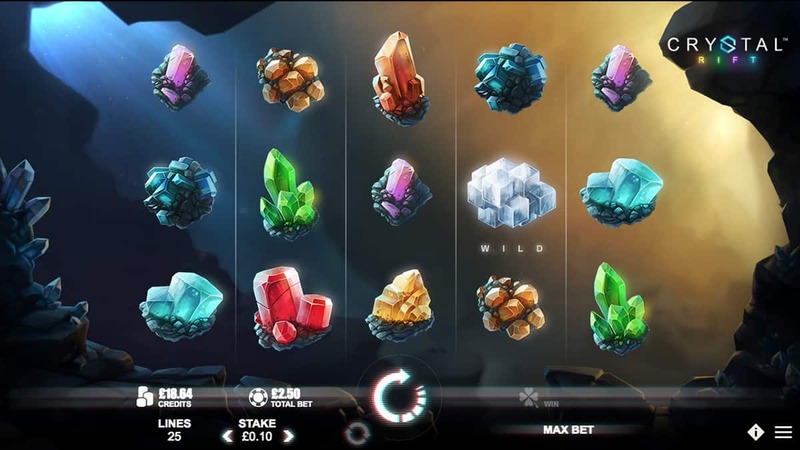 Microgaming gives us a new take on crystal mining. There are no cartoon prospectors or dynamite. It’s just a simple submergence into the heart of the terra and the crystals come tumbling down. And tumble they do with the Bonus Falls feature and explode into wins thanks to the grid formations, labelled the Basic, Super, Mega and Insane Grids. Cave exploration has never been better.